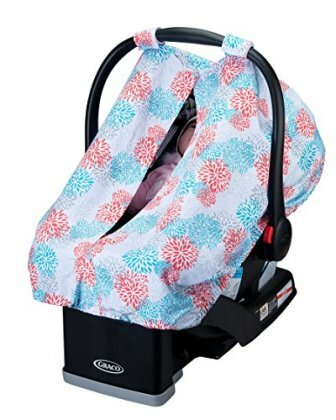 ♥♥ Baby Car Seat Covers with UV Protection. Lightweight, NonSlip Adjustable Handle Straps. Fits All Infant Car Seats. Best Baby Gifts. Protect Your Child Today! SAFETY FIRST-Unlike any other baby car seat covers, our cover is coated with UPF50 Sun Protection, ensuring that your child is protected from the sun at all times. No need to worry about sunburn from exposure. UNIVERSAL- Ergonomically designed to fit ALL infant car seats including Graco, Maxi Cosi, Britax, Cosco, Peg Perego etc. FRONT OPENING-Features a front panel opening with secure velcro closures so you can peek in, insert a toy or pacifier, or check up on your baby anytime. STAYS IN PLACE-With its elasticized bottom and NonSlip adjustable velcro straps, this cover won't flap up from the wind and will stay put at all times. TRAVEL BAG-Includes a very handy travel drawstring bag, making this the ideal baby gift set. Simply roll the cover into the bag and tuck it into your stroller, diaper bag or pocketbook for easy access when needed.